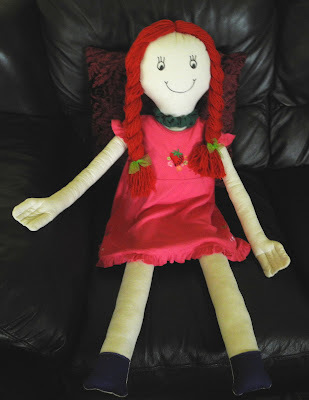 I have spent the week sewing, making this floppy rag doll for the CPL (Cerebral Palsy League). It will be used by the kids to hug. Ahhhhhh. I volunteer at the CPL for a few hours every Tuesday doing anything I can to help behind the scenes trying to free up time for the therapists so they can concentrate of the kids. I also do some sewing and crafting whenever I can on projects at home. Therapeutic items, dolls, equipment and clothing is sooooooo very expensive﻿ and as is more often than not the families are not in a financial position to pay the hundreds of dollars they cost. I was so caught up in getting her finished I forgot to take photos as I went...... next time.